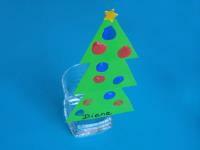 Miniature Christmas trees for your table. 1. Gather your material. 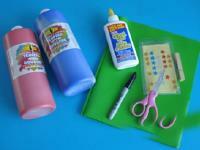 You will need a green plastic duo-tang, star-shaped stickers, a permanent marker, blue and red poster paint, a wooden clothespin, white glue, and scissors. 2. 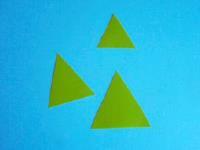 Cut three triangles out of the cover of the plastic duo-tang (a big one, a medium-sized one, and a small one). 3. Glue the triangles one on top of the other, with the largest one at the bottom and the smallest one at the top. Pour a small quantity of blue and red poster paint in an aluminum pie plate. 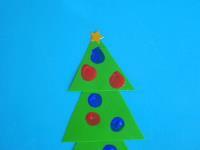 Press your finger in the paint and then on the Christmas tree to represent ornaments. Let dry. Use the permanent marker to write the name of the person at the bottom of the tree. 4. 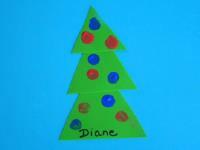 Add a star-shaped sticker at the top of the tree. 5. 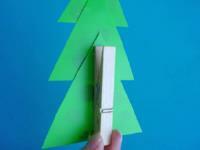 Glue the clothespin behind the Christmas tree as shown. 6. 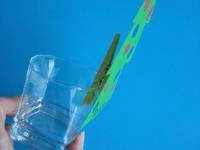 Use the clothespin to secure the place card on a drinking glass or napkin.